Professor Efrem Mallach PhD literally wrote the book on analyst relations. A quarter of a century ago, Win Them Over was the first book about influencing analysts, consultants and advisors. Building on his experience at Honeywell and as an analyst, Mallach led two analyst relations consultancies, Kensington Group and Lighthouse AR, before joining Kea Company as research director earlier this year. The expanded third edition of the book is introduced by Ludovic Leforestier, co-founder of the IIAR. 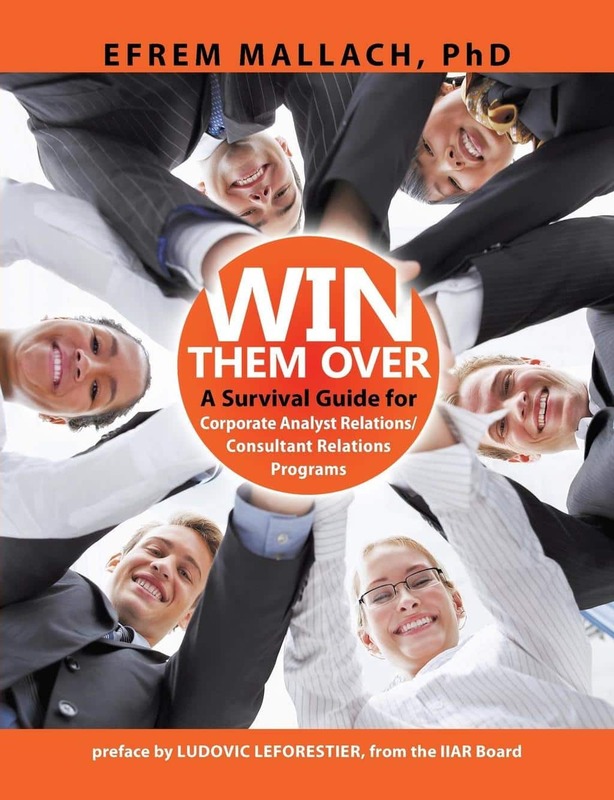 WIN THEM OVER was the first guide to corporate programs for influencing consultants and analysts, in 1987. Now in its third edition, Dr Mallach’s landmark book is a unique, step-by-step guide to what really works in building relationships with analysts, consultants and other influential advisors. 1. THE IMPACT OF ADVISORS. The impact of advisors. Who analysts and consultants are. It shows exactly how advisors influence sales. You’ll learn how industry analysts and consultants impact your sales. 2. WHAT ANALYSTS AND CONSULTANTS WANT. This book shows the relationship between the goals and means of an analyst/consultant relations program and the information content that consultants and analysts require. You’ll learn what their “hot buttons” are as well as their emotional “red flags” – so you don’t accidentally hit one when you do something that might perfect for a different public – but might antagonize advisors. 4. PLANNING AND ALIGNMENT. Internally-focused influencer relations activities are the foundation for putting your analyst/consultant relations program in place. This book shows how influencer relations in your organization relies on showing how valuable your program is – and shows you how to prove it. 5. EXECUTING OUTREACH. Professor Mallach goes through everything involved in working with analysts and consultants: planning a program, publicizing it, running it, auditing its effectiveness. This book helps you to assess your program resource requirements and gives you the tools you need to firm up your program timetable. This section also involves a review of real analyst/consultant relations programs.